If you still can’t get over the setup I pointed out on the daily timeframe of GBP/USD yesterday, then maybe zooming in to the 4-hour chart will help you decide whether to buy or sell the pair. It just formed a hanging man candlestick at the 1.5900 psychological handle which is also coincidentally the 38.2% Fibonacci retracement level. 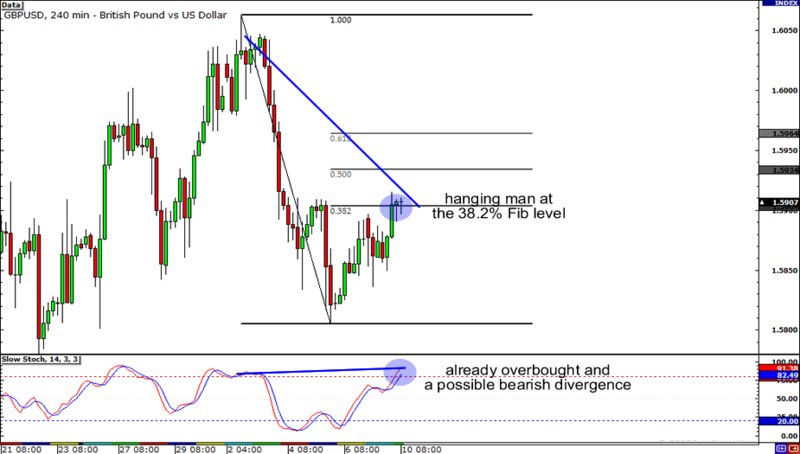 Stochastic also suggests that the pair could soon trade lower, indicating that it is already overbought and that there is a possible bearish divergence. However, don’t get too excited selling the pair just yet. Note that the Stochastic lines still haven’t crossed. Ain’t feelin’ GBP/USD? Don’t fret! There’s a similar setup on the hourly chart of USD/JPY. Connecting the pairs recent highs and lows, we see that it has formed a descending channel. Now USD/JPY is trading in the middle of it, testing the 50% Fib level, but Stochastic is already in the overbought area and we could see a possible bearish divergence once the lines cross. It might be a good idea to wait for candlesticks to materialize first before trading the pair though. 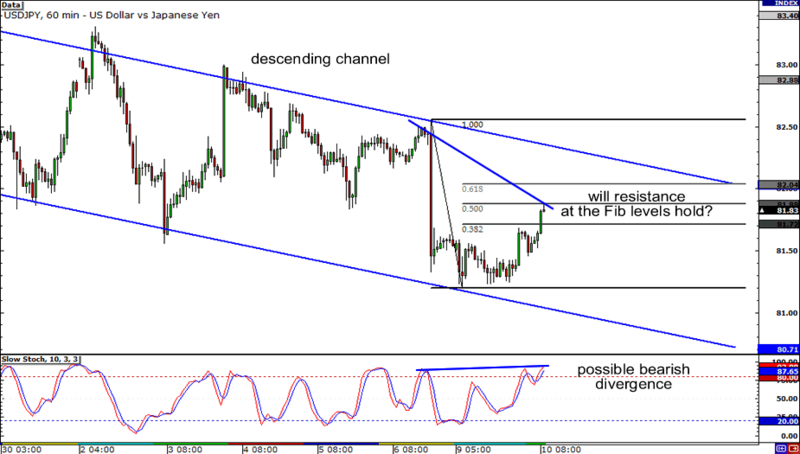 Reversal patterns around the Fib levels could signal that USD/JPY would drop to the bottom of the channel around 81.00. On the other hand, if there are still enough bulls left in the market, the pair could trade past the Fib levels and test the top of the channel, a little above 82.00. Finally, here’s USD/CHF for y’all! The pair actually looks pretty interesting on the 4-hour timeframe. If you’re bullish on the dollar, you could say that the pair is actually forming a bullish pennant. 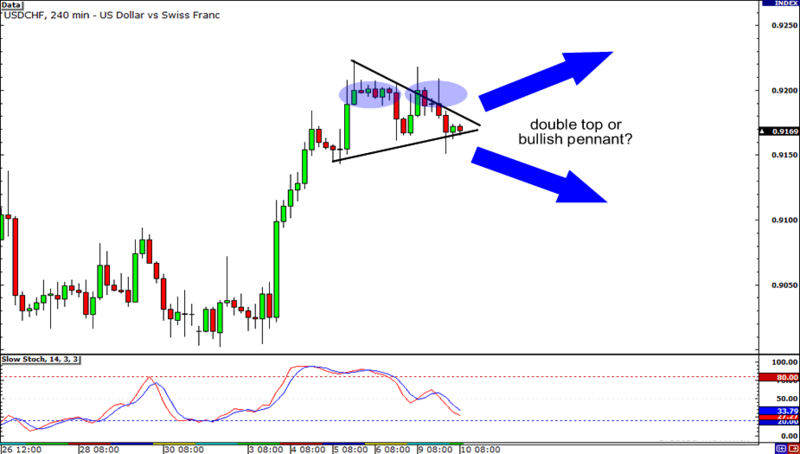 However, if it’s the Swiss franc you’re bullish for, you can argue that the pair has formed a double top. Note that it has gotten rejected at the .9200 handle twice. So which side are you on? As I always say, be sure to wait for confirmation before pulling the trigger. A convincing close below .9150 could hint that USD/CHF is on its way down to .9000. Meanwhile, a close above .9200 could mean that we’ll soon see the pair trade above .9300 again. So be on your toes!